Budgets – everyone has them. Unless you’re lucky enough to have a money tree in your backyard or become rich and famous, budgeting is a reality. Healthy eating has so many benefits. It helps children grow and develop to their full potential. It helps prevent diseases and nourishes your body. Many of my clients state that their budget is the biggest barrier to eating healthy. I don’t think this has to be true. With a little planning, you can eat healthy and stay within your budget. Eating healthy can be done on a budget. 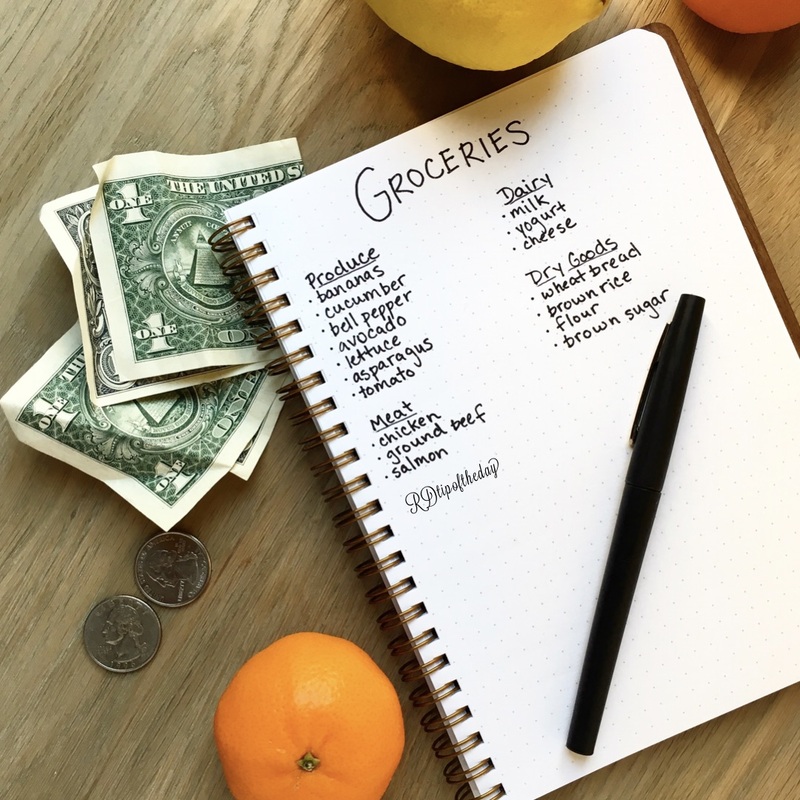 Here are a few of my tips to meal plan, eat healthy, and stay on budget. 1) Make a meal plan. - Start with a meal plan. Plan out the meals, sides, and snacks you and your family will eat for the week. Take into account any nights you may eat out. 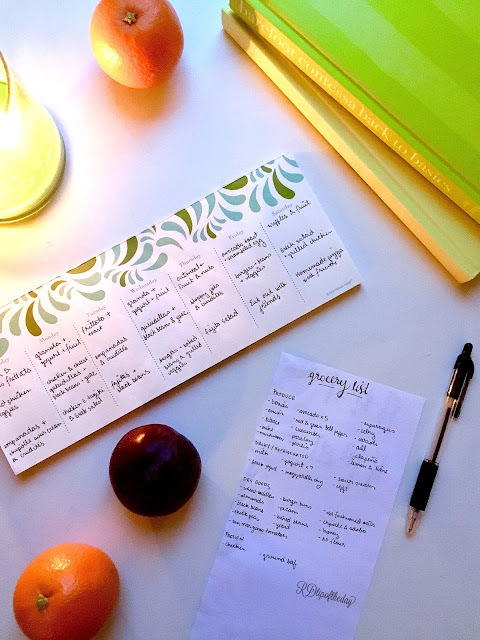 - A meal plan helps you build a grocery list, which can help you stay on budget. - Make your grocery list at home, and stick to it at the store. 3) Look for coupons and store discounts. - When I meal plan, I look at my grocery store’s weekly ads and coupons on their app. If I plan meals around what’s on sale, I can easily stay on budget. - Produce grows at different times of the year. When produce is in season, it’s cheaper. 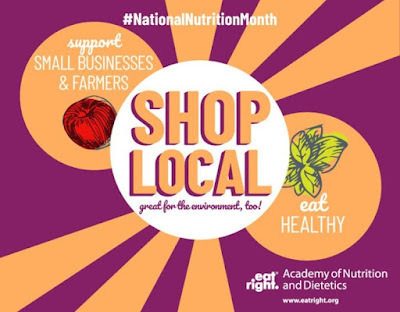 You can find out what’s in season by checking online at More Matters or at your local farmer’s market. One of the reasons that in-season foods are cheaper is that they are grown locally and don’t have to be shipped as far. This reduces costs for the grocery store and you. 5) Try canned or frozen produce. - Canned or frozen fruits and vegetables can be cheaper. These foods are picked in season and preserved by canning or freezing. This is cost effective for the farmers and saves you money. - I like to have a mix of fresh, canned, and frozen fruits and vegetables available. I try to use my fresh produce at the beginning of the week. Then, I use the canned and frozen foods toward the end of the week. These leads to less food waste and saves money! 6) Make things at home instead of eating out. - The cost of a meal at a restaurant is so much higher than cooking a home. Try to cook at home more often than eating out. We try to limit eating out to 1-2 times per week. See what works for your family. - Here’s a challenge. Try making your favorite restaurant meal at home. Compare the prices. Also, compare the time. Does it take less time to cook the meal or drive and order the meal? I would love to hear your findings. Do you have any tips for healthy eating on a budget? What's your favorite meal to make at home? What's your favorite app for coupons or budget shopping? For more tips and recipes for a healthy lifestyle, you can follow me on Facebook, Pinterest, Instagram, and Twitter.